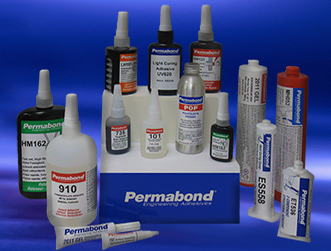 Permabond is a leading manufacturer of anaerobic adhesives and sealants (threadlockers, retaining compounds, pipe sealants and gasketing adhesives), cyanoacrylate (instant adhesive), epoxy, acrylic and UV-curable adhesives (ideal for glass and plastic bonding). Contact your Cline Tool representative for more information about these products. Uses: threadlocking, threadsealing (or pipesealing), form-in-place gasketing, retaining, bearing fit, bullet sealing, sealing weld porosities. Cure mechanism: single part, cures in the presence of metal / absence of oxygen. Uses: bonding rubber, plastic, metals and wood. Ideal for small assemblies / fast moving production lines. Cure mechanism: single part, moisture cure. Uses: structural bonding, potting, coating, encapsulation. Cure mechanism: Two-part epoxy products require resin and hardener to be mixed. Can be cured at ambient or heated for a faster cure. Cure mechanism: Single part epoxies require a high temperature heat cure (e.g. oven). Uses: structural bonding of metals, composites, plastics, glass, magnets and ferrites. Cure mechanism: No-mix adhesive with intiator, bead-on-bead resin & hardener, 2-part pre-mix with nozzles and single-part products available. Uses: bonding glass or plastic to itself or other substrates e.g. metal. Produces a clear, transparent, non-yellowing finish. Cure mechanism: Single-part, cures rapidly on exposure to UV light. Some products can be cured by visible light. 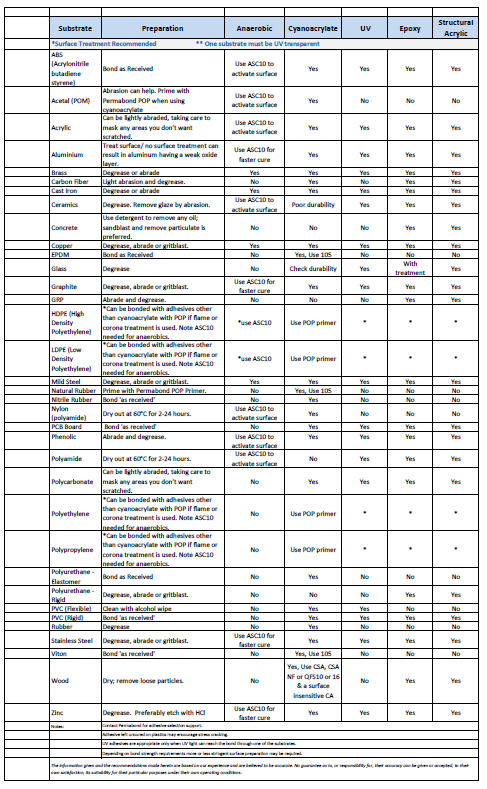 Dual cure products also available (anaerobic-UV or moisture cure-UV). Cure mechanism: Single component moisture cure and Two component products available.